Surveillance is a critical component of effective prevention and intervention. Agricultural injuries and illnesses are higher than many other industries, and information about these events can help in the development, implementation, and translation of prevention programs and policies. Provide local and state agencies with information about trends and characteristics in agricultural traumatic fatalities and injuries. Provide an infrastructure to assist GPCAH collaborators to integrate surveillance data into their activities. Conduct research on agricultural injury trends and characteristics. Agriculture plays a vital role in society by providing critical market goods such as food products and raw materials for manufacturing. The farm lifestyle has been a mainstay of American culture. However, the agriculture industry has one of the highest fatality rates in the United States and poses particular risks to vulnerable populations such as elderly workers. In 2010, the Bureau of Labor Statistics reported that the agricultural industry ranked third in the rate of recordable injuries, trailing only to the health care industry and the transportation and warehousing industry. 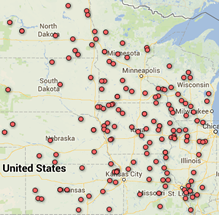 In addition, NIOSH reported that about 243 US agricultural workers experience a lost time injury every day. These reports likely underestimate the magnitude of the injury problem on farms however, because many farm injuries may not meet the inclusion criteria for OSHA reporting. For example, businesses with 10 or fewer employees are not required to keep OSHA illness or injury records. Farming as an occupation involves many exposures and hazards which place farm workers at high risk of injury. These include working with machinery, animals, and hazardous environments (Karttunen and Rautiainen, 2013; Jawa et al., 2013; Sprince et al., 2007; Swanton et al., 2016). One unique aspect of the farming industry is that farm family members are also exposed to these hazards, even when they are not involved in farm operations (Fisher et al., 2009; Goldcamp et al., 2006; Gross et al., 2015). Certain segments of the population, particular those who were male or elderly, had a higher frequency of fatalities. The estimated rate of fatal injury (especially among young and elderly workers) was higher in crop production than in animal production (15.9 vs. 10.8 per 100,000 workers). As expected, most fatalities took place on farms during working hours in months when agricultural workers are most active (planting and harvest) and were most commonly the result of transportation-related injuries. Injuries on farms are both work and non-work related. During the period of 2005‐2011, a total of 79,740 trauma patients were included in the Registry, of which 2,490 (3.1%) were designated as farm‐related. Among these farm‐related injuries, 51.7% were attributed specifically to work and the remaining 48.3% were non‐work related. 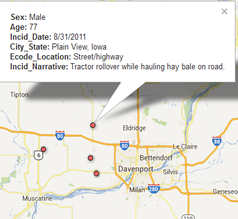 Tractor-related injuries are common. 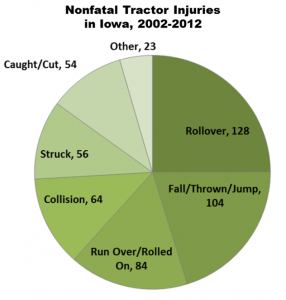 In a ten year period, there were 513 nonfatal tractor-related injuries in the Registry. ‘Rollovers’ were the most frequent mechanism of injury (25%), followed by ‘Falls’ (20%). ‘Run overs’, ‘Rollovers’, and ‘Collisions’ were significantly associated with higher injury severity. One reason for increased fatalities among agricultural workers is challenges in timely access to medical care. Compared to typical rural work injuries, agricultural injuries have longer periods in time from injury to time the injured person is discovered (e.g., ambulance is called), time to reach the hospital, and time to reach definitive medical care. We found that though fatalities most often occurred within 24 hours of the inciting injury, deaths occurring after 24 hours were more frequent with increasing age. The fact that some older individuals do not die immediately of their injuries suggests that there may be an opportunity for medical intervention to potentially save these lives. We have examined agricultural injuries that were treated at specialized acute care facilities (Trauma Level I, II and III hospitals). During an eight‐year period (2005‐2013), there were significant increases in injuries from falls, transportation, machinery, and from natural and environmental exposures (e.g., heat). We have examined payer source for traumatic injuries, with a focus on worker’s compensation. Our preliminary results indicate that fewer than 15% of work-related agricultural injuries used worker’s compensation as the payer source, as compared to 65% for other non-agricultural work-related injuries. Work-related agricultural injuries were far more likely to use non-health private insurance as coverage (including property and vehicle insurance). The Surveillance Core collected newspaper clippings of agricultural fatalities and injuries for several years, in hopes that newspapers could be a comprehensive source for reporting of agricultural injuries. Although we ultimately determined that newspaper clippings were not a good source for comprehensive surveillance, we did create several useful products. The GPCAH Surveillance Core aims to provide our partners with information about the frequency and characteristics of fatal and non-fatal agricultural injuries. In addition, we have created visual data (infographics) to translate the study findings into clear and practical information.